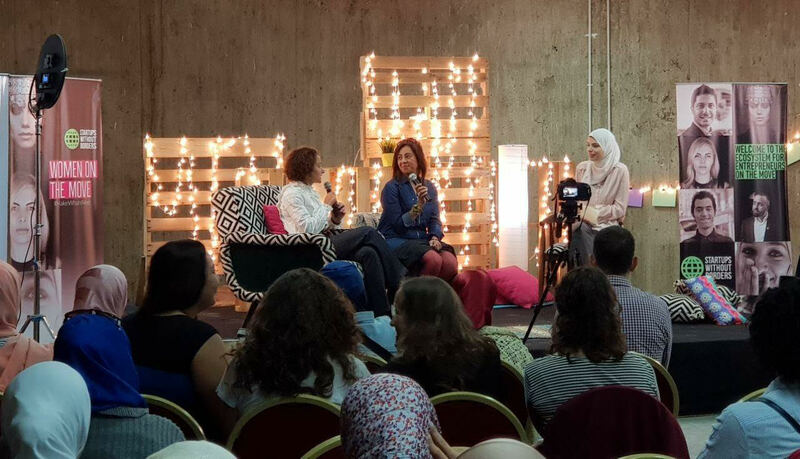 More than 200 participants have gathered as part of “Women on the Move” event, held in the entrepreneurial hub of the Greek Campus aiming at linking women entrepreneurial refugees and migrants to the ecosystem in Egypt. “Women on the Move” event has been organized by a number of civil society organizations located in Cairo such as Startups without Borders, a recently-launched community empowering refugee and migrant entrepreneurs, Fard, a non-profit organization for supporting refugees and migrants economically in Egypt, and Entreprenelle, an Egyptian online platform for women empowerment. The event brings investors, mentors and a number of refugee and migrant entrepreneurs from Syria, Iraq, Yemen, Sudan and South Sudan to further engage them in the Egyptian ecosystem,” said Valentina Primo, the founder of Startups without Borders. The day-long event brought experts in finance, technology and incubation and acceleration programs to deliver tips and pieces of advice for female refugee and migrant entrepreneurs who want to launch their startups in Egypt and are lacking the knowledge to this. According to Global Entrepreneurship Monitor (GEM) 2017 report, there is one woman in every four entrepreneurs in Egypt. A finding that sees that women entrepreneur’s rates are still lower in comparison with global scene. The Egyptian entrepreneurial ecosystem is attracting youths in the age of 23-35 years old, which according to the report, is a great potential for both new founders and the society due to the high population rate.